Premium Keemun Black Tea (祁门红茶) is one of the Three Most Famous Black Teas in the world, with the other two Darjeeling Black Tea and Ceylon Uva Black tea. Unlike the other two black tea from tropical zone and big leaf cultivar, Keemun Black Tea is from subtropical zone and the cultivar is typical Chinese small leaf. This tea looks very cute and exquisite in appearance. It gives a natural smooth milky fragrance even without adding milk. It’s the best match to make a cup of milk tea. In China, there is only a small place able to produce this precious black tea, which is Keemun County （祁门县）of Anhui Province. In 1875, the retired low-ranking imperial official YU Gan-chen invented the Keemun Black Tea (祁门红茶) in his hometown keemun County (祁门县). 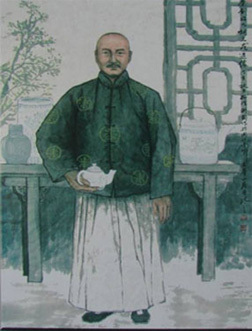 YU Gan-chen used to serve as a tea tax official in Fujian. 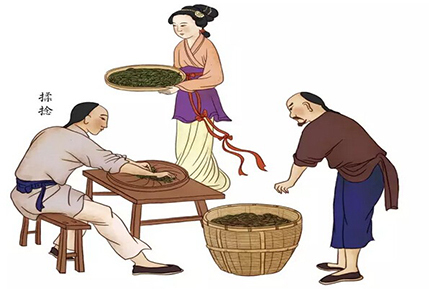 In Fujian he learned the processing of Tan Yang Gong Fu Black Tea, and as a tea tax official he knew the high profit of tea business at that time. So after his retirement he decided to develop the tea business in his hometown. Before the invention of Keemun Black Tea, the Keemun county was producing green tea all the while. 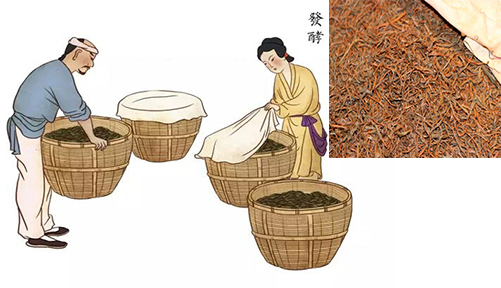 The workers YU Gan-chen hired from Fujian used the keemun tea material to process black tea. It turned out to be a huge success. 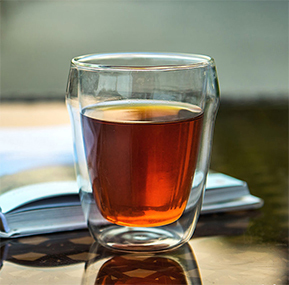 The outstanding quality of Keemun tea material and the ingenious skills of the tea workers made the newly-born Keemun Black Tea fantastic quality. It had fine smooth fruity fragrance, and pure sharp mellow taste. Keemun County is located in the South Anhui. 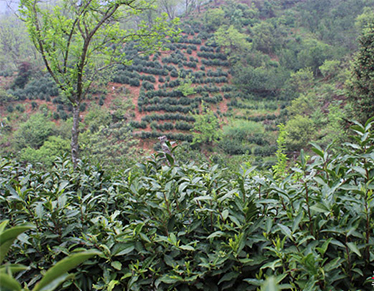 And South Anhui is one of the best tea planting places in China. 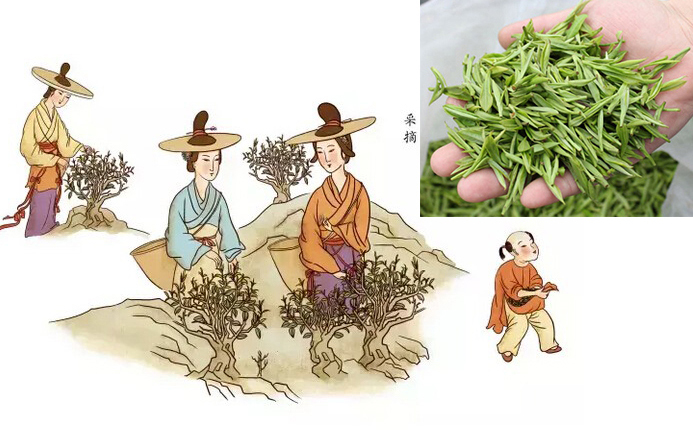 South Anhui also produces the other famous Chinese teas, Huang Shan Mao Feng, Tai Ping Hou Kui, Liu An Gua Pian, Huo Shan Huang Ya and Tong Xi Huo Qing. 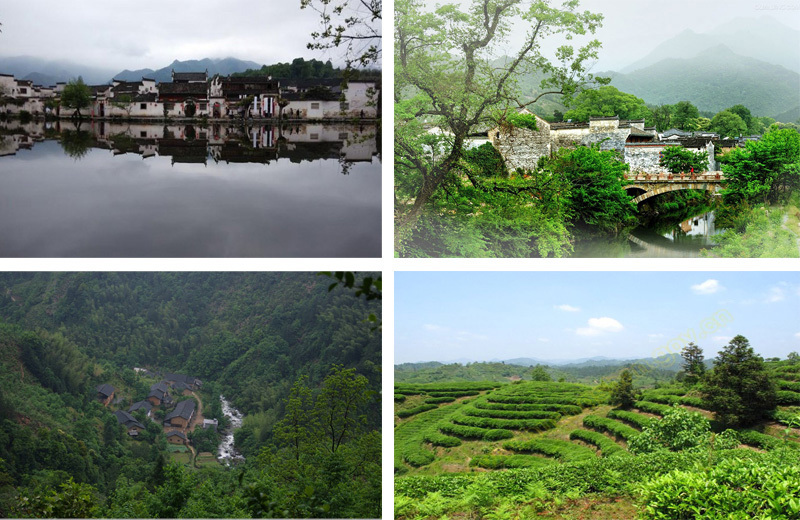 The South Anhui region has beautiful natural scenery and it is covered by dense forestry. The tea growing here under good ecological system and is endowed with good nature. 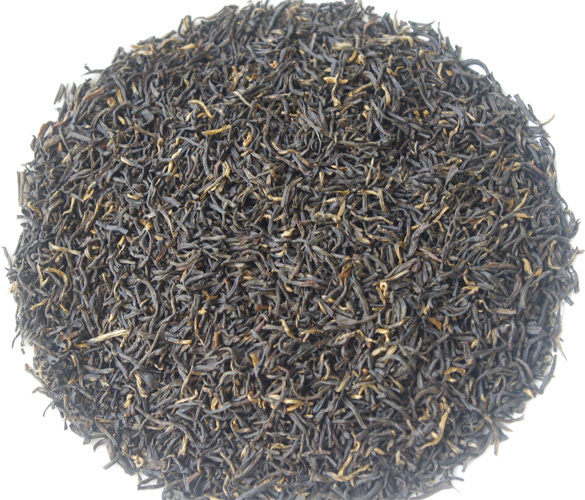 Keemun Black Tea is made by the Keemun County local small leaf tea cultivar Zhuyezhong. The plucking season is in the Qingming Festival 清明节(in the beginning of April). The ideal material to make Keemun Black Tea is one bud one leaf one bud two leaves. One bud three leaves will also be plucked to make the lower grade Keemun Black Tea. 1 Withering The plucked fresh leaves will be sent for withering. The leaves are put on the bamboo bed in a thin layer. The natural withering will last several hours. when the water content in the leaves are left at around 60%, the withering will stop. 2 Rolling. The after withering tea leaves will become soft and it is able to conduct rolling now. The traditional rolling is conducted by hand. The rolling will break the cells of the tea leaves and the tea juice will come out. The tea juice will produce reaction under oxygen surroundings, which is the fermentation of Black Tea. Rolling will also shape the tightly round tea body. 3 Fermentation. The rolled tea leaves will be put in the bamboo basket for fermentation. A wet cloth will be covered on the surface to keep relatively high moisture for the fermentation. The fermentation will last around 10 hours in early Summer days. 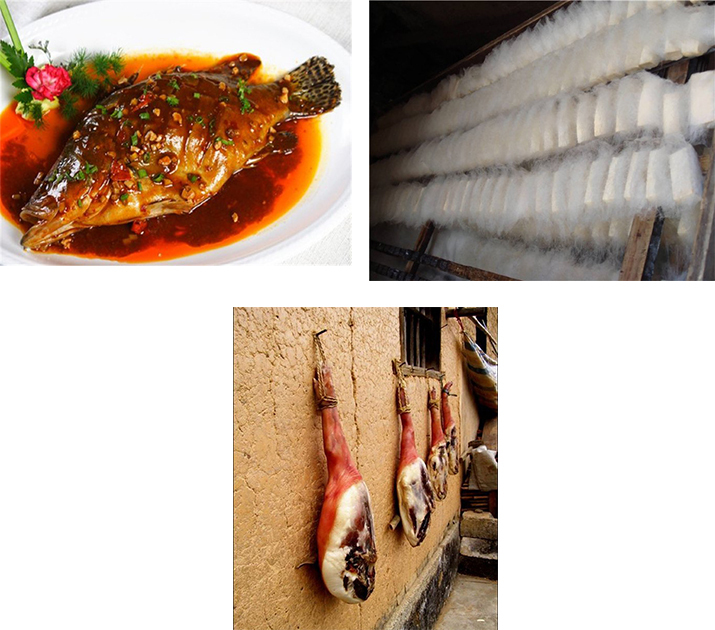 However it needs the workers’ experience and insight to decide the critical point of the fermentation under different moisture, temperature and ventilation situation. Generally when the leaves turn out to be bright copper red color and gives off a kind of ripe apple flavor the fermentation is enough. And it needs to stop the fermentation quickly. 4 Baking dry The after fermentation tea will be spread out to cool down for a moment. Then it will be sent for baking dry. The traditional drying uses charcoal baking. (Modern processing adopts electric baking machine). During the traditional drying, the tea is put in an even layer on the surface of a bamboo baking cage. and the charcoal is burning under the cage. 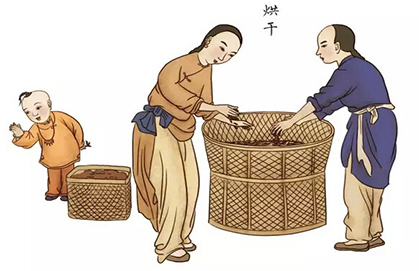 The traditional charcoal baking needs very high performance of the workers. They need to keep wacthing out the drying process and control the temperature very well. During the whole baking, no any smoke is allowed to occur.it is believed that in most cases, the traditional charcoal baking under skilled workers handling can produce better flavor and taste of Keemun Black Tea than electric baking. The proper good quality Keemun Black Tea has fruity sweet flavor and the taste is very smooth. After baking, the rough processing of Keemun Black Tea is finished. And this is the Maocha (rough tea) of Keemun Black Tea. The Maocha will be sent for refining processing. In the refining processing, the tea will be sorted into several grades. And the tea body will be cut short. The cut-short of tea is conducted for the sake of transportation. In the ancient time, the transportation of tea to overseas is quite uneasy work. While the tea after cut-short can be put more weight in the same packing. These are a few grades of Keemun Black Tea. This is the brewing of Keemun Black Tea. Keemun is a place worth a visit!